As more people and organizations demand higher data rates to stream high definition (HD) video for broadcasting, surveillance, or social media applications, the need for capacity continues to increase for wireless communication systems. In addition, once more advanced technology such as 4K video becomes mainstream, performance pressure on the RF data link for mobile applications will increase to a point where current technology cannot provide acceptable performance. Applications include handheld devices (4G/LTE, 5G), as well as conventional and unmanned vehicles (UGV, UAV, etc.) These RF links are already straining to increase bandwidth. In essence we are already at this point, as many real time videos are distorted, interrupted, or presented in a lower data rate stream than the source content. There are various solutions to these challenges which we will discuss, including MIMO technology, high gain antennas, tracking systems, and Bi-Directional Amplifiers (BDAs). Each comes with positive attributes, as well as tradeoffs. According to the equation, the only way to increase the channel capacity is to either increase the bandwidth or increase the SNR. As the bands set aside for RF transmission are extremely limited due to the allocation of the RF/Microwave spectrum, the only practical way to increase channel capacity is to increase the SNR. Several technologies have been developed to address this challenge; one of the most successful and promising is Multiple-In Multiple-Out, more commonly known as MIMO. 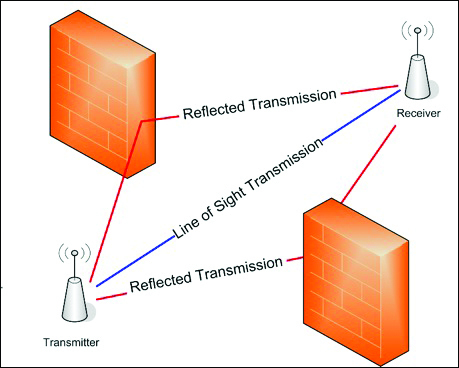 Many MIMO users link their radios to create mesh networks which allow radios to join or leave the network at any time. The network will continuously adapt its topology as nodes move in relation to one another. Without a central master or hub controlling the network and serving as a single-point-of-failure, communications will continue even when one or more nodes are lost.4 Mesh networks have the ability to self-heal, as well as increase the geographic size of the network by linking to one another and, in turn, reaching out to nodes which are even more distant. MIMO systems tend to be more expensive than their traditional counterparts, however, due to their increased prevalence throughout the market, they are becoming increasingly affordable. Additionally, for smaller systems, locations will need to be designated for multiple antennas. The failure point of how far a signal can travel is determined when the transmit power, attenuated by the total path loss of the system, does not overcome the required receiver threshold. Or, in other words, when the loss over the air exceeds the minimum signal level the receiver can distinguish over the environmental noise floor. Any additional signal power above this threshold is referred to as link margin. When there is no or low link margin in the system, the link will ultimately fail over the desired distance. Radio Frequency interference (RFI) from outside sources also negatively affects the distance the network can reach as well as data rates of a particular channel in the network. As defined by Techopedia, RFI is the conduction or radiation of radio frequency energy that causes an electronic or electrical device to produce noise that interferes with the function of an adjacent device.5 RFI can come from things as simple as lights, laptops, and cell phones. Other communication devices that are on the same vehicle, such as on an Unmanned Aerial Vehicle (UAV), will also interfere with the data link. When RFI is present, the environmental noise floor is raised, sometimes significantly, which will decrease the S/N of the system to a point where data can no longer be discerned, and the link is lost. Minimizing RFI is imperative to maintaining the link and providing the promised data rate at the desired distance. Even if the RFI is controlled at the ground station, the mobile unit may encounter other RFI issues down range. If this occurs, the link could be lost and the vehicle’s mission would be unsuccessful. One solution to improve the robustness of the RF link is incorporating the use of high gain antennas and/or tracking antennas. By adding gain via the antennas, you are increasing the margin so that the link can stay intact in a poor RFI environment. Although these types of antennas have proven track records, they do come with tradeoffs. The first is sensitivity to environmental factors, such as small movements due to a mobile environment or even wind. As the gain of an antenna increases, the beam width typically decreases. This means even a minor movement of a high gain antenna can cause the signal to be lost when the two systems no longer align. Secondly, as the gain of an antenna increases, so does its aperture, or dish size. Many size and weight sensitive applications cannot bear these design tradeoffs which make these systems impractical, such as with UxV/UAV or ground mobile applications. Tracking antennas are typically smaller than stand-alone high gain antennas, as they have the advantage of being more directional. However, this also comes at a cost. Tracking antennas are required to move constantly to remain aimed at the target. This means that motors are required, increasing the cost and complexity of these systems. Having more moving parts on a mission critical piece of equipment is not always practical. Another proven solution to improving the margin of a system is adding bi-directional amplifiers (BDAs) to the link. If properly integrated with the radio, BDAs can extend the distance of the mission by a factor of 10 while maintaining the desired data rate. They can also be used to increase the data rate for a fixed distance as they increase the amplitude of the signal, thereby increasing SNR. Use of BDAs can also further increase the data rate as there is now enough margin to transmit more complex modulations, allowing for faster data transfer. BDAs have added cost and will consume DC power, which can be at a premium on a mobile application. However, due to the advances of Gallium Nitride FET technology, amplifiers have become much more efficient, meaning they provide more RF power while consuming less DC power. For example, a 2.0 x 2.5 inch, S-Band Dual Channel BDA will consume ~28W while providing over 5W of 64 QAM power per channel. Some BDAs have enough gain and power to increase the link margin up to 20 dB. This allows a vehicle to travel over ten times as far (LOS) as one without amplifiers. In addition, with a low noise figure of 2 dB or less, the receiver side of the BDA becomes nearly invisible in the system and does not contribute to additional path loss between the radios. The gain in the receive side also makes up for any loss between the receive antenna and the radio. In some cases, the BDA may additionally overcome local RFI near the UxV or GCS (Ground Control Station) that would otherwise degrade or destabilize the link. BDA supply voltages typically have wide input ranges such as +9 to +32 V which allows them to run on existing battery buses (+13V) and aircraft DC power, allowing for easy integration without requiring significant changes or alterations to designs. As can be seen, increasing the robustness of RF links is a tricky business, however, there are multiple weapons in one’s toolkit to increase capacity and combat RFI. MIMO is a radio technology that is taking hold worldwide. 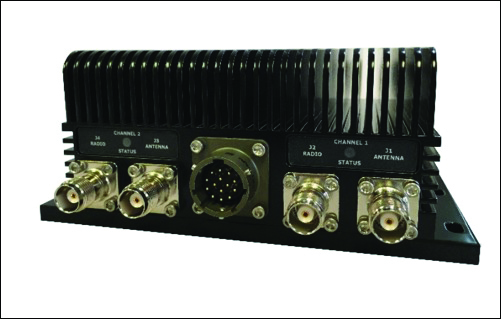 This wireless technology increases the channel capacity of the system while improving the reliability of the link. High gain antennas and tracking technologies can be employed, however, the mobile aspects of many RF links (UxV systems) do not always allow for the size, complexity, and sensitivity trade-offs that come along with them. BDAs can be employed, in conjunction with these other technologies, or alone, to increase the link margin of systems that are underperforming, however, there is a modest cost and power trade-off to be considered. BDAs allow less complex and expensive antennas to be used and can increase the link distance by a factor of 10. 1. C. E. Shannon, “Communication in the Presence of Noise,” Proceedings of the Institute of Radio Engineers, Vol. 37, No. 1, January 1949, pp. 10-21. 2. Mathuranathan Viswanathan, “Channel Capacity & Shannon’s Theorem – Demystified”, Gaussian Waves, April 23, 2008. 3. David A. Hall, “Understanding Benefits of MIMO Technology,” Microwaves & RF, May 19, 2009.